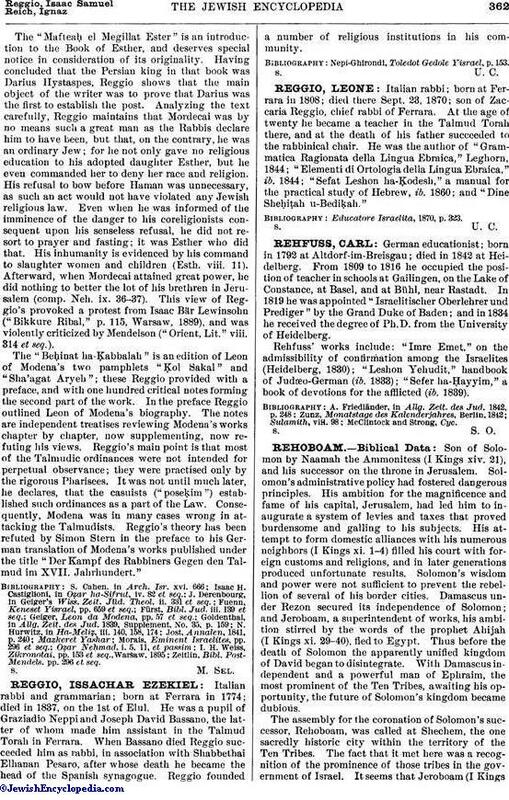 Italian rabbi; born at Ferrara in 1808; died there Sept. 23, 1870; son of Zaccaria Reggio, chief rabbi of Ferrara. At the age of twenty he became a teacher in the Talmud Torah there, and at the death of his father succeeded to the rabbinical chair. He was the author of "Grammatica Ragionata della Lingua Ebraica, "Leghorn, 1844; "Elementi di Ortologia della Lingua Ebraica," ib. 1844; "Sefat Leshon ha-Ḳodesh," a manual for the practical study of Hebrew, ib. 1860; and "Dine Sheḥiṭah u-Bediḳah." Educatore Israelita, 1870, p. 323.